Oil on panel, 34 x 44 cm. A boy leads a white horse into the stable as a storm is brewing outside. Inside the stable is a brown horse drinking out of a bucket and a stable boy fetching more hay. In the background, a man and a boy brave the bad weather. Although Philips Wouwerman was first and foremost known as a landscape painter, he was also renowned by his contemporaries for his unique ability to paint horses with great precision and accuracy. 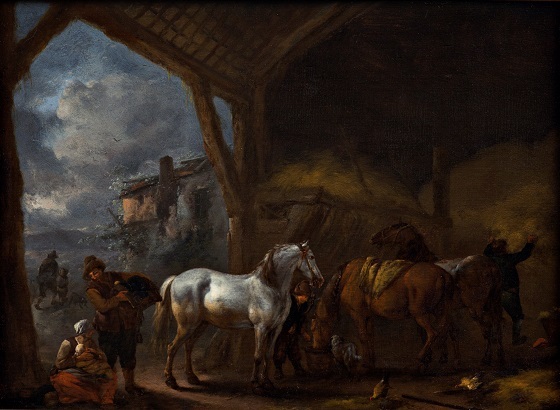 The anatomy and movement patterns of horses are brought into focus in his travellers’ stable paintings, while the surrounding landscape often merely serve as the outer framework for the scene. They can accordingly be regarded as animal studies rather than actual landscape paintings. In this work, the white and brown horse also take prominent places in the composition of the painting, while the bleak landscape help lend a certain depth and mood to the scene.